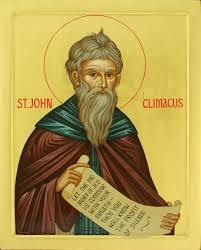 This Sunday, the fourth Sunday of Great Lent, we reflect upon the teachings of St. John Climacus or St. John of the Ladder. In his famous work known as The Ladder of Divine Ascent, St. John writes how our life can be perfected in a union with Christ. He illustrates 30 steps that are necessary to reach Jesus and the Kingdom of God. Through these steps, we make changes in our lives that help us to become Christ-like, to experience Orthodox Christian perfection which is to live just as Jesus did. At work or school, everyone discusses the newest and latest self-help books… identifying ways in which you can grow rich, put your kids through college, make thousands of dollars working at home. However, one of the only books that identifies our daily struggle and work for our salvation is the Ladder of Divine Ascent. The common theme we have heard throughout Lent this year is that we will be judged by our works. As we pass the mid point of Great Lent, let us refocus our Stewardship efforts on our Time, Talents and Treasures. Pray and consider how we can make a difference and let’s remember St. John’s guidance that we “live just as Jesus did” and exercise all of the gifts that God has provided to us. O holy Father John, with rivers of tears you have made the barren desert bloom, and with heartfelt sighings of repentance you have made your labors bear fruit a hundredfold. O Saint, pray to Christ our God for the Salvation of our souls. Amen.